During any period of increased physical activity, our bodies work harder to deliver oxygen and nutrients to the muscles. Our bodies expel higher levels of carbon monoxide and as a result must work harder to absorb more oxygen. The lack of oxygen can, and does, cause muscle fatigue, cramping and poor performance. Boost Oxygen is the perfect supplement to help increase endurance and cut down recovery time. 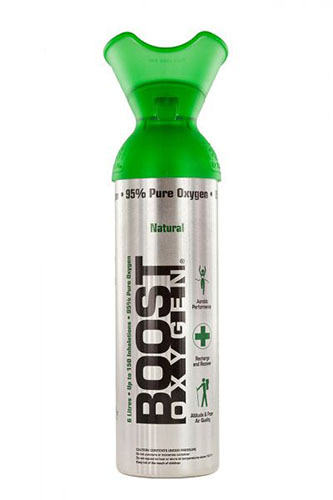 Boost Oxygen is 95% pure oxygen, all-natural and safe. According to the World Anti-Doping Association (WADA), supplemental oxygen is not considered a banned substance. Get the most out of your workout by using Boost Oxygen in Peppermint or Natural. Take three-to-five inhalations before an event, three-to-five during a rest period and three-to-five at the end to speed up your recovery.